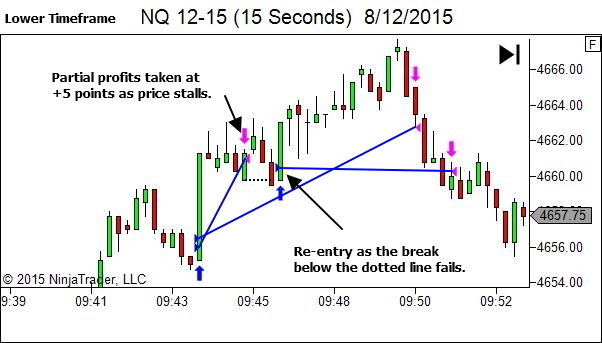 One of the advantages of low timeframes is that you can FEEL the price action. By "low timeframes", I'm referring to any timeframe which allows you to watch the screen continuously. So we're probably talking anything in the range of 5 minute charts and lower. Operating on higher timeframe charts, where you're only getting a visual sense of the price movement as each candle closes, you're missing out on the real-time feel for sentiment that comes through experiencing the way price moves in creating that candle. The exits were not perfect. But that's the nature of exits. They almost always can be improved upon, when viewed with the benefit of hindsight. All we can do when trading at the hard right edge of the screen is manage the risk and potential reward as best we can. But it's the entry that I was really pleased with. 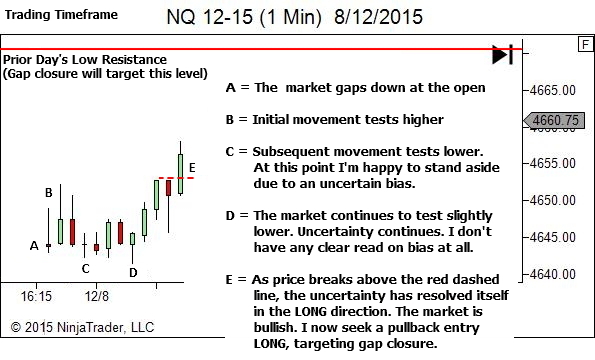 The context was good and suggested potential for a directional market (gap down open, with initial uncertainty perhaps trapping a few new sellers who hoped for continuation, then resolving itself in the gap closure direction). And then given this context, the first break of a TTF candle against the bias direction, was not able to continue lower. 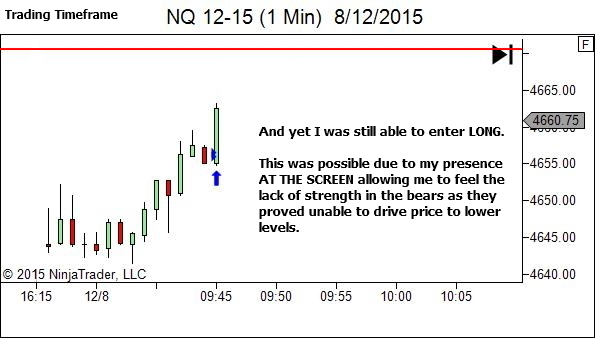 Entry was not a result of confirmation through a bar closing to new highs. It was taken upon recognising that price couldn't fall. 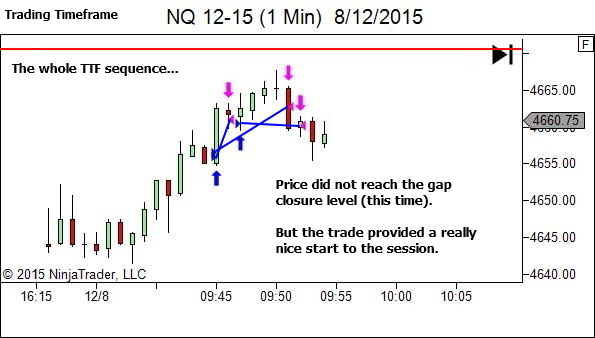 Sellers were not strong enough to overcome the buying pressure. 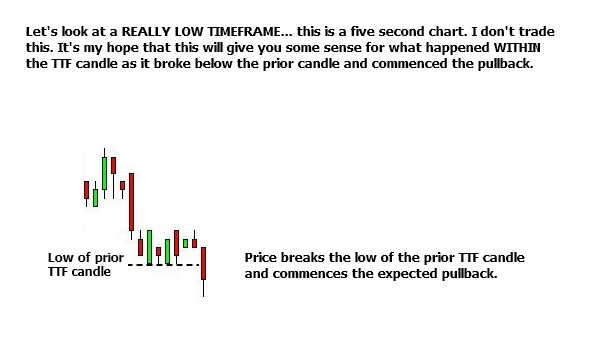 This was not simply observed through a snapshot view of price movement taken on the close of each TTF candle, but rather it was sensed through feeling the strength or weakness of price movement tick by tick as it moves intra-candle. 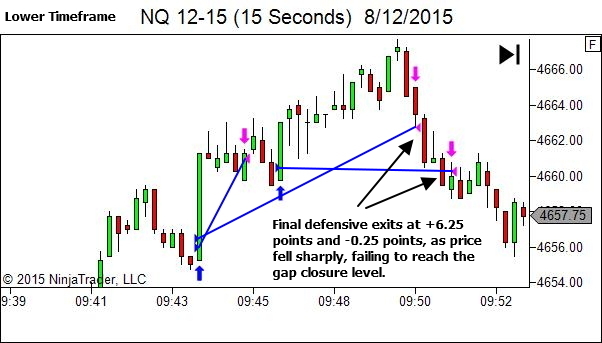 This, for me, is one of the advantages of low timeframe trading. (b) A mindset that is prepared for decisive action. There are so many parts to this – confidence in strategy, confidence in your ability to decisively limit loss if you get it wrong, confidence in your skill at reading the market bias etc etc etc. (c) A focus AHEAD of price. Like a series of “IF-THEN” statements. Where is price going? How should it act if this is likely to occur? Will that provide opportunity? (d) Flexibility, and a willingness to amend your plan if price movement shows something unexpected. As seen in this article. My focus was ahead of price, in anticipating a pullback to the marked level, with an expectation that if there was no signs of bearish strength in that area I’d be seeking an entry long. Inability to even reach that area was recognised, leading to an adjustment to the plan. Hi Lance, brilliant article and I agree wholeheartedly. 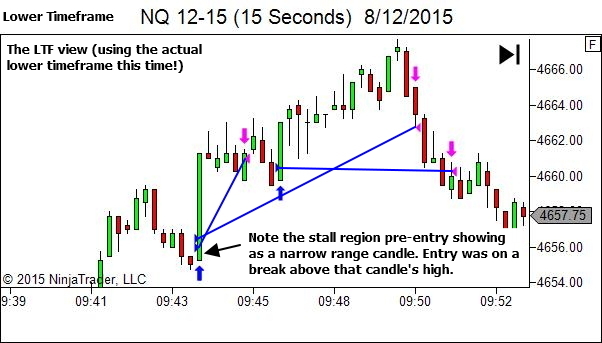 One challenge I have though is with overnight price action when I am asleep. When marking my S/R lines on the higher timeframes, for the times of day when I am asleep is ok, I find it a challenge to understand this same price action on the smaller timefrmaes. I hope my question is clear. Any thoughts? Hi Nick, Sorry! I’m actually not sure what you’re asking. Can you rephrase it please? Sorry for the ambiguity. 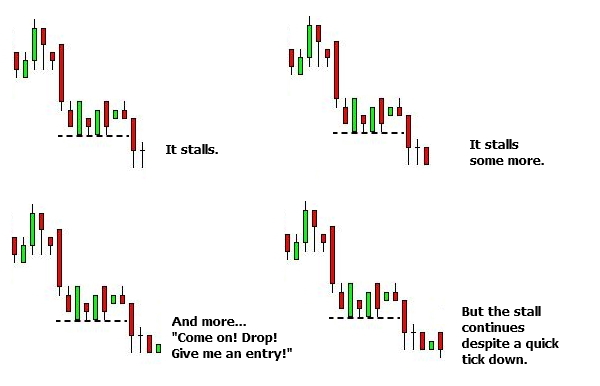 Please allow me to rephrase: While I don’t look at second or 1 min charts, the lowest I go down to is the 5 min chart. Now, as part of my morning routine, marking off S/R on higher timeframe 30/60 minute charts from yesterday’s and overnight session is easy. However, within this higher TF S/R understanding the price action S/R on smaller 5 min charts is challenging since this action happened when I was in bed. When I observe 5 min price action in real time, I find it easier to analyse. So my challenge is analysis and understanding price action on smaller 5 min charts for the session whcich happens when I am in bed to mark my S/R lines. Thanks. What I’m failing to understand is why you’re needing to analyse the 5 min price action which created the overnight S/R levels? Yeah, good point. Now that I think more about it, look at HTF S/R levels and real time PA on smaller TF’s as price approaches these HTF S/R levels? Different traders operate in different ways. There are some who aim to identify the highest quality levels only; operating via a limit order at the level combined with great faith in the levels holding. These traders will need to examine the way that price interacted with the level last time it was there, as part of their evaluation of quality. However, it could be argued that the overnight levels will rarely be of sufficient quality, due to the lack of participation. An exception to this could be levels created following overnight significant news events. But generally, if you’re interested in analysis of the price action at the time of formation of the levels, stick to the day sessions only. I don’t operate this way. I don’t aim to identify the highest quality levels; and I don’t put blind faith in levels holding. I simply identify levels that had some past influence on price, and expect that they may do so again in future. 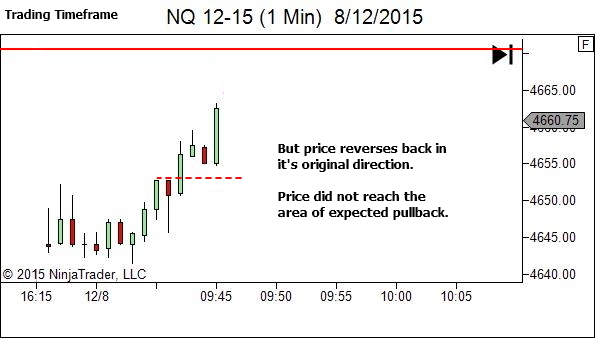 I place greater value on the way price behaves WHEN it gets back to the area. 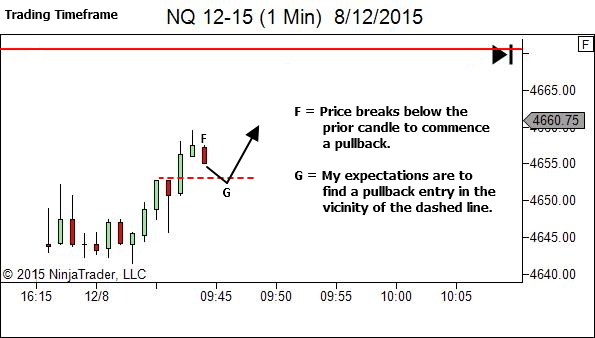 So for me… there’s less need to analyse the way price behaved in forming the level. That being said, if there is a significant supply/demand imbalance last time price was there, it will likely be obvious. And it’ll be something that I’m aware of when price returns to the level. But it’s not something I go looking for. Great explanation Lance! Makes sense. Appreciate you penning it down.